If you had to describe your feelings toward your dog in three words or less, what would you say? Do angry, embarrassed, and frustrated sound familiar? Don't stress any longer; you have come to the right place: Bark Busters of Anne Arundel County. During our 7 years as dog trainers, we have trained more than 1,800 dogs throughout Anne Arundel County, including Annapolis, Arnold, Crofton, Churchton, Crownsville, Davidsonville, Deal, Eastport Edgewater, Gambrills, Gibson Island, Glen Burnie, Harwood, Millersville, Pasadena, Severna Park, Riva and neighboring counties. In Home Training . All training occurs in and around your home. Why do we train in your home? The home is where your dog is most comfortable, less stressed, most receptive and most likely to display bad behaviors! Once you both understand the basics, we'll introduce distractions to solidify your dog's obedience and make sure you can maintain control no matter what situation arises. Personalized Dog Training. Every dog is different and his/her behaviors are somewhat unique. Our first lesson will last approximately 2 to 3 hours ... you'll see immediate changes in your dog's behavior! Follow ups lessons can address any lingering problems. We will develop a personalized lesson plan based on your goals. Unlike dog training classes, our training is not "one size fits all." Positive Reinforcement. Our dog training system is shock collar free, clicker free and gimmick free ... no harsh methods for us. Speak Dog. We teach you to "speak dog." We will teach you a method of communication that your dog already understands, based on canine communication, body language, and pack leadership. You will learn how to use your body language and vocal communication to get your dog to focus on you and respond to your direction based on a relationship of mutual trust and respect. 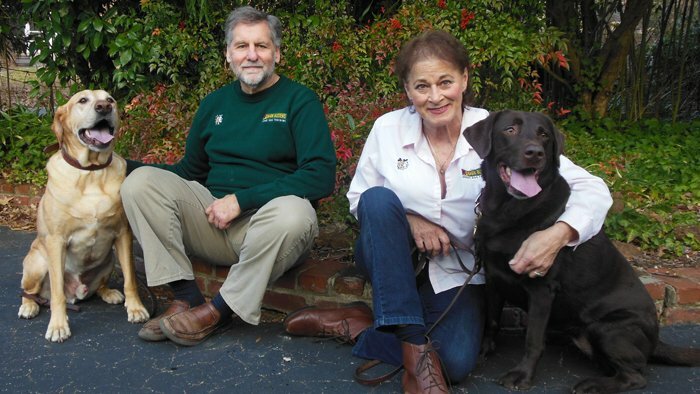 Meet John & Joan Grosskettler - Your Anne Arundel County Dog Trainers. Take some time now and take our Bark Busters Behavior Rating Quiz. Our greatest joy is to see dogs with a "D" or "F" rocket back to an "A" dog. We get great satisfaction seeing the WOW factor during training. Ideally, no dogs would be abandoned or relinquished because of bad behavior. Too many dog owners trade in their dog in hopes of replacing him or her with a "good dog." Over a lifetime of working with dogs, we have experienced all types of behavior problems and different personalities of dogs. With this knowledge and experience, we are dedicated to achieving positive results with you and your dog and are happy to help our clients in every way possible. We provide a complete and balanced approach to training our clients by teaching you to engage with your dog by optimizing relationship, obedience and behavior. The result is a deeper relationship between human and dog based on trust and respect which in turn produces a happier and more obedient dog.